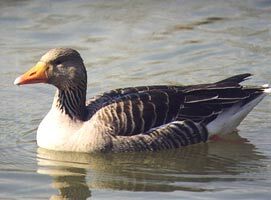 One of the larger grey geese, the greylag is the stock from which most western Europe farmyard geese are descended (unlike eastern Europe where the bean goose gave rise to most farm stock). Both sexes are brownish grey with paler grey forewings and white barred tail coverts. The bill is orange in the western race and the legs are flesh coloured. The heavy head and bill are more obvious in flight than with other geese and the pale grey shoulders and white rump show up clearly. It has a low "aung-aung" call similar to farmyard geese. 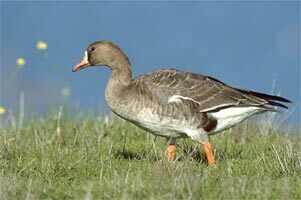 Somewhat smaller and daintier than the greylag, the pinkfoot is characterised by a chocolate brown head and neck. The body is paler brown with bluish-grey tinges in the wing coverts and darker grey in the tail. The rump, as with all grey geese, is white. 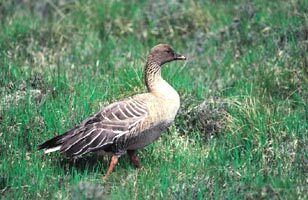 The bill of the pinkfoot is smaller and neater than that of the greylag, being pink coloured with variable black markings at base and tip. As the name suggests, the legs and feet are pink. 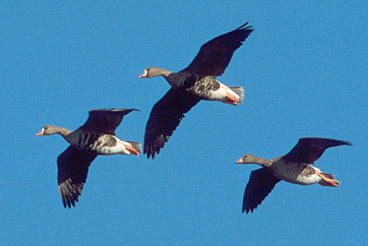 In flight the dark neck and head are obvious and, when compared to a greylag, its slender shape and neat head are clear. It has the familiar "wink-wink-wink" call. 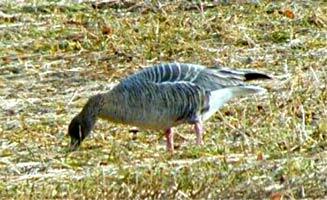 The USSR whitefront is a dark goose, mainly grey-brown with black traverse barring across the lower breast and belly. Adults have a distinctive white forehead. The bill and legs are bright orange. Birds of the European race tend to have an overall lighter plumage and a pink bill. It is of medium to large size and in flight can be seen to have a darker, more slender head than the greylag. It gives out a high pitched "hank-hank-hank" call. 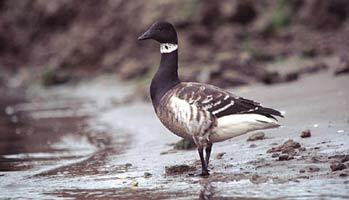 The bean goose is a very large bird with dark brown neck and head and dull brown underparts. The breast is light brown, there are pale edgings to the wing coverts and the bill is orange with black markings. Both sexes have a black crown, neck and breast with white cheeks. The back is grey and the underparts are off-white. In flight it is a smallish goose with the white face and black breast clear. It rarely flies in formation, preferring loose flocks. The voices of a flock of barnacles sounds like the "yipping" of a pack of small dogs. There are two distinct sub-species of brent geese; the light-bellied race breeds in Greenland and Spitzbergen and winters in Ireland and at Lindisfarne while the dark-bellied Siberian population migrates to the marshes of Iraq & Iraqn in winter. This latter race has increased dramatically in recent years and a change in habits has taken place with the flocks partially forsaking the salt marsh and adapting to feeding on agricultural land. Both races have a black head, breast and neck and a dark grey-brown back. There is a light patch on each side of the neck and, as the names suggest, the Atlantic population has a lighter belly than the Siberian race. In flight the brent has fast wingbeats and frequently flies in tight packs. It is often silent and is more likely to be mistaken for a mallard than for any other goose.